Kansas Wesleyan University Debate & Forensics students last week competed at the National Christian College Forensics Invitational and brought home multiple nation champions. According to KWU, twenty Christian colleges and universities from across the nation gathered at Azusa Pacific University in Azusa, CA, on March 8–10 to celebrate their Christian heritage and compete in a national debate and individual event competition. Kansas Wesleyan University brought home four national championships from the three-day National Christian College Forensics Invitational (NCCFI). The overall school champion across all classes of universities and all events went to Seaton Hall, with Liberty University placing second and Kansas Wesleyan University placing third, just six points out of first. For Individual events only in Class II, universities with smaller numbers of entries, Kansas Wesleyan placed first. 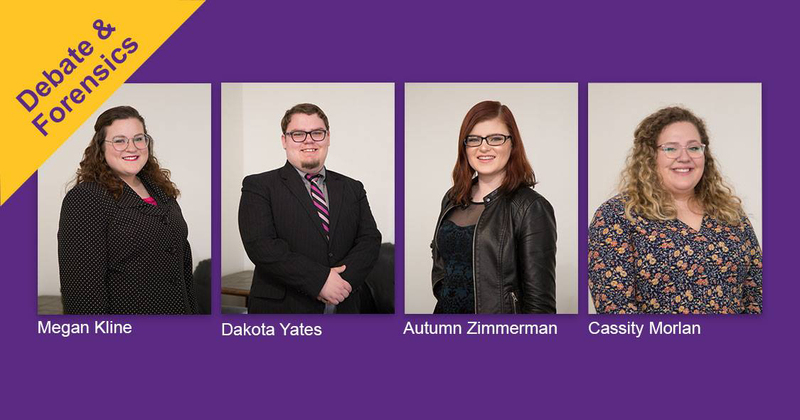 Kansas Wesleyan Parliamentary teams had won their last four tournaments, and the team of Megan Kline and Dakota Yates won Parliamentary Debate for The Coyotes’ first national championship from NCCFI. Sophomore Cassity Morlan and junior Autumn Zimmerman placed third. Kline, a sophomore, added another national championship when she was recognized as the national champion debate speaker at the tournament. Yates, a senior, won two more national championships, one in Communication Analysis, and one in Impromptu Speaking. Other Coyotes winning awards and contributing to the overall school placing were Zimmerman who placed second in Communication Analysis, second in Program of Oral Interpretation, fourth in Informative Speaking, was fourth debate speaker, and sixth in Extemporaneous Speaking. Kline placed fourth in Lincoln Douglas debate, fifth in Extemporaneous Speaking, fifth in Informative Speaking and was a semifinalist in Impromptu Speaking. Yates placed second in Extemporaneous Speaking. The tournament also recognized students for their total points earned with Individual Sweep Stakes awards in Individual Events and Combined Debate and Individual Events. Zimmerman placed second in Individual Sweepstakes and fifth in Combined Individual Sweepstakes. Kline won fourth in Combined Individual Sweepstakes.